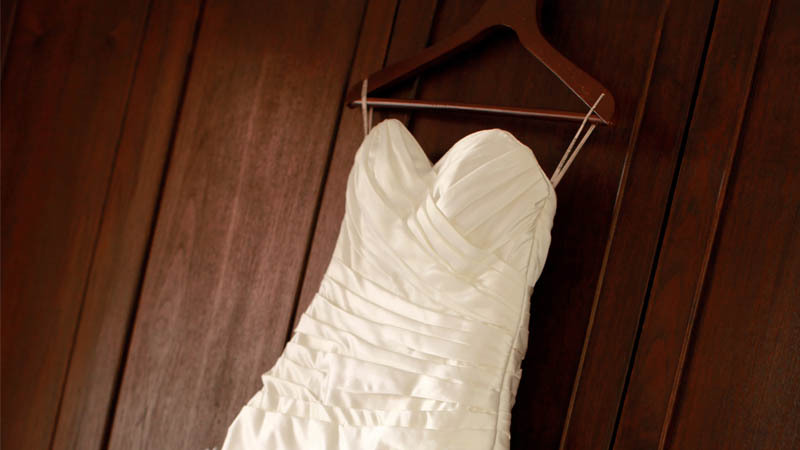 Exclusive SYSTEMK4 Wedding Dress Cleaning Service to Restore and Protect Your Gown. Our one-step checkout process allows you to securely and quickly order your kit through our website. To ensure your information is safe, we don't store any of your personal information and our checkout process is protected by the highest level of security from GlobalSign™. Your kit will contain everything you need to securely pack your gown in our crushproof shipping container and poly bag dry cleaning . You will also receive your included pre-paid shipping labels along with $500 shipping insurance. You will receive an e-mail notification when your gown arrives and is checked into our system. Our world class SYSTEMK4 museum quality cleaning technology restores and protects your gown. Your gown receives a meticulous museum quality cleaning utilizing our exclusive SYSTEM K4 delicate fabric cleaning technology. The last step protects your fabric from future yellowing and will also help protect your gown if is worn again. Your gown is then carefully placed on a formed bust to maintain the shape of your gown then into a poly dry cleaning bag and packed into our crushproof, water resistant shipping container, ready for the return trip to your home. You beautiful, prestine gown is delivered back to your doorstep. Your gown is safely and securely shipped back to your home looking as beautiful as it did when you first wore it walking down the aisle. Your gown is ready to be worn again and you've increased the value of your dress should you choose to sell it to another bride. Your gown will arrive placed on a formed bust inside of a poly dry cleaning bag to keep your gown for storage until it is worn again or sold. After you order you’ll get access to GownTracker™ giving your status updates as your dress is received, cleaned and delivered back to your home. On the most amazing and memorable day of your life we know the last thing you wanted to worry about was keeping your wedding gown in pristine condition. There were guests to greet, great food and drinks to be enjoyed and of course, a dance floor that was calling your name all evening. While you were busy having an amazing time your dress was being introduced to all kinds of elements that cause long term staining and yellowing. Some of the worst offenders are sweat and deodorant, dirt and grass, foods such as icing red wine, makeup and many more. While at first glance you may think that your dress came out of your action-packed day unscathed, the unfortunate truth is these invisible stains will wreak havoc on the delicate fibers of your wedding gown if left untreated. White satin will become dull and muted, sweat stains will cause the underarms of your dress to yellow and dirt trapped in your hemline will start to brown the fabric. The only way to prevent your dress from becoming a dull shadow of its former self is have your gown professionally cleaned by wedding dress cleaning experts. It is for this reason that we've created our Wedding Gown Clean-Only Package to bring back the brilliance of your gown without a full preservation. 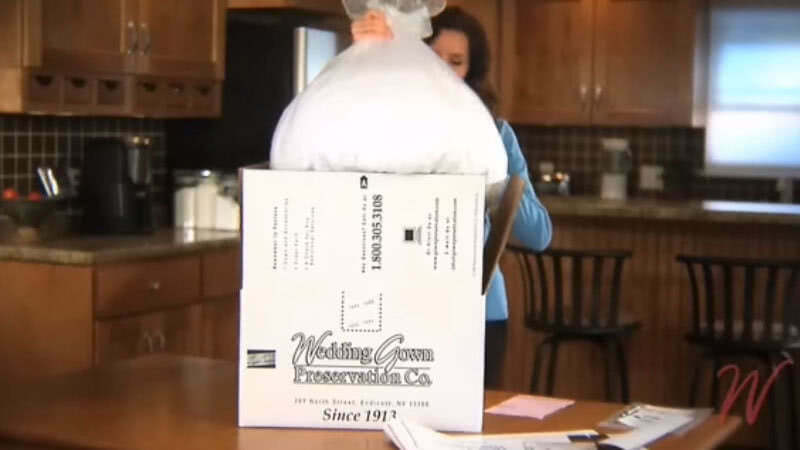 This package is perfect for brides who purchased a pre-owned gown, brides who plan on selling or loaning their gown after their wedding, or for any other reason you wish not to have a full preservation performed on her wedding dress. 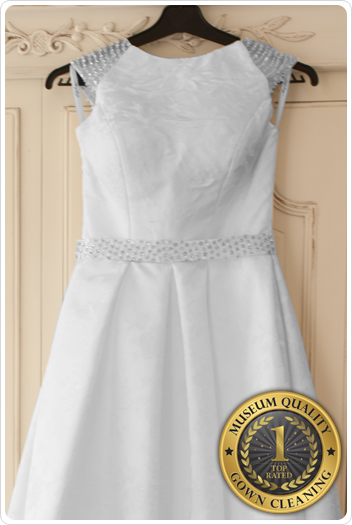 When you order our Wedding Gown Clean-Only Package, your dress will receive a museum quality cleaning with our SYSTEMK4 technology which is specially formulated for delicate fabric care. Your Clean-Only package also includes $500 worth of shipping insurance which you can increase at the time you receive your kit and FREE 2-way shipping to be professionally cleaned by our experts. Does the Clean-Only kit come with your 100 year guarantee? No. Because your gown is not stored in a proper long-term storage container after cleaning and can be handled, we cannot provide our 100 year anti yellowing guarantee. When is the best time to order my Kit for an upcoming wedding? The best time to order your Clean-Only service is one month or earlier than your wedding date. Our Clean-Only service takes approximately 2 weeks from the day you order on our website to the day you receive your gown. Can I return my Clean-Only kit if I decide not to use it? Of course! If you purchased our Clean-Only service as a gift or for yourself and you or the recipient end up not using it, you can contact us to let us know and you will receive a 100% refund on your order. There is no need to return the box or its contents, however, the order number will be de-activated from our system making it unavailable to use in the future. It's that easy! We've taken every step available to make sure your gown is safe and secure as it is shipped to our facility and back to your home. The finished gown requires a signature from a resident of your home and each kit comes with shipping insurance included to keep your mind at ease. 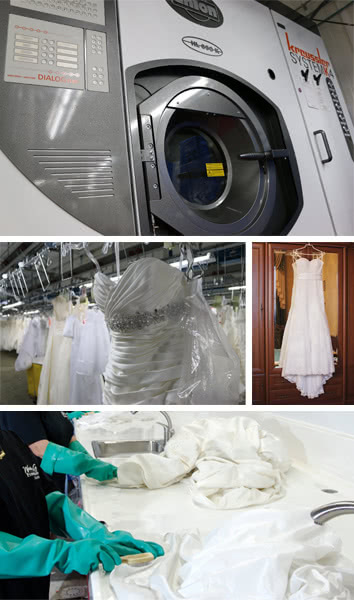 Over 3 million brides can attest to the safety of our time-proven wedding gown cleaning service while saving hundreds of dollars at the same time. How do I add extra insurance? When you receive your Clean-Only kit, you'll find paperwork inside that will allow you to add any extra amount of insurance you'd like which will be in addition to the included insurance that comes with your order ($500 for the Clean-Only). Extra insurance is $2.00 for each $100 of extra insurance you'd like to add. Can I have my cleaned dress sent to a different address? Sure! This option is available to you during the checkout process and when you receive your kit you'll have another opportunity in the included paperwork that will allow you to specify a different address to have your finished dress sent to on the return trip. Choose to add a photo to your preservation box if you'd like to show your friends and family what your gown looked like when you wore it on your wedding day. You can choose any wedding photo from your wedding day but we recommend a photo of you alone in the dress or with you and your partner so the details of your gown can be seen.